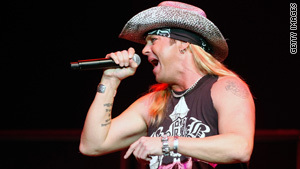 A hole in his heart likely caused Bret Michaels to suffer a warning stroke this week, his publicist said. (CNN) -- Rock singer Bret Michaels had another health setback this week when doctors found a hole in his heart that they think caused him to suffer a warning stroke, his publicist said. Michaels, 47, may still be able to appear on the season finale of the reality show "Celebrity Apprentice" on Sunday, his doctor said. The announcement did not say whether Michaels' plan to resume touring with his rock band May 28 will be changed. The singer felt the left side of his body growing numb this week, prompting him to return to the Phoenix, Arizona, hospital that treated him for a massive brain hemorrhage a month ago, a statement from the publicist said. His doctors concluded that Michaels had suffered a transient ischemic attack, which they said is a warning stroke, that was prompted by a patent foramen ovale, a hole in his heart, she said. Dr. Joseph Zabramski, the neurosurgeon who treated his brain hemorrhage, said, "The positive patent foramen ovale is devastating news." Zabramski said, "The good news is that it is operable and treatable, and we think we may have diagnosed the problem that caused the transient ischemic attack, or warning stroke." The heart problem was probably not related to Michaels' brain hemorrhage, he said. "I realize Bret wants to make a full recovery so that he can be active with his family, attempt to attend the finale of 'Celebrity Apprentice' and especially get back on the road to continue making music," Zabramski said. More medical tests are needed to determine what happens next, he said. "For now, Bret will be treated with outpatient care, which includes a daily injection of Lovenox [a blood thinner to reduce the chance of blood clots] and blood tests," he said. Janna Elias, Michaels' representative, said the rocker is in good spirits despite the latest medical report. "He is up, walking, talking, continuing his daily rehab and very happy to be alive, but he has made it clear he is sick and tired of being in the hospital and is ready to rock again," Elias said. Michaels is the lead singer for the '80s glam-metal "hair band" Poison. He became a reality TV star by headlining the VH1 show "Rock of Love With Bret Michaels." He has also appeared on "Celebrity Apprentice." His Roses & Thorns tour with the Bret Michaels Band was interrupted when the singer was stricken by an excruciating headache on April 22. Doctors at the Barrow Neurological Institute diagnosed him with a rupture in his brain, but they never pinpointed the cause. Michaels was released from the hospital 12 days later with orders to rest.